My name is Tracey Evison and I am mummy to a gorgeous little girl called Lucy Needham. Her Daddy and I welcomed little Lucy into our world in September 2013. Lucy was a very healthy baby girl and adored her half-brother Jack, aged 12 and her half-sister Molly, aged 7. We all live in Chesterfield. In August 2014 we received the most unimaginable news possible. After just a couple of weeks of sickness and lethargy, Lucy was diagnosed with a rare, fast growing, malignant brain tumour. She had emergency surgery to remove as much of the tumour as possible, followed by chemotherapy in September 2014. She received chemotherapy at Sheffield Children’s Hospital every 2-3 weeks until December 2014. This included having to spend her 1st birthday in hospital. In December 2014, Lucy received high dose chemotherapy followed by a stem cell transplant. We were in hospital for over 5 weeks and Lucy spent Christmas Day in hospital. 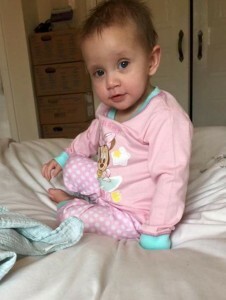 Lucy has MRI scans every 4 months currently and so far the little bit that was left after the main surgery has not regrown or changed in any form. We are hopeful the tumour will stay away forever. Lucy was very poorly during the high dose treatment and we even had one night in intensive care just before Christmas. It was a very frightening and exhausting time. It was during this time that Paul, Lucy’s Daddy, would stay at the PACT house so that he could be with Lucy and I as much as possible. Although we only lived in Chesterfield, Paul was so very grateful for the use of the house as it meant when Lucy had a sleepless night, which was frequent, I could rest in the day a little if Paul was there. It also meant that if things took a turn for the worse overnight Paul could head straight back to the ward to be with us. No one ever wants to spend Christmas with their children in hospital but Beryl and friends of PACT tried to make it as special as it could be. Lucy received some lovely presents from PACT friends and Paul and I were treated to a gorgeous hamper with all sorts of lovely treats in them. Beryl was often there on the ward to offer a smile, a hug or just a chat if that’s what we needed. She is a lovely, kind generous woman who makes the difficult times in life that bit easier. Lucy’s tumour has affected her in more ways than we ever realised it would. She has lost the ability to swallow and we are still waiting for her to make those first steps. Lucy is peg fed and is currently 21 months old. She is getting stronger day by day, and now has her lovely hair back, but we still have a long way to go on this journey. We think PACT is a wonderful charity and are keen to support their appeal to fund a new oncology and haemotology clinic. M3 became our home for several months and as fantastic as the nurses and doctors are the ward itself and some of the resources are looking tired. The plans for the new clinic and treatment centre look amazing and will benefit so many families. We will be doing as much fundraising as we can to support this. Thank you PACT for being there when we needed you the most. Now it is our turn to say thank you.